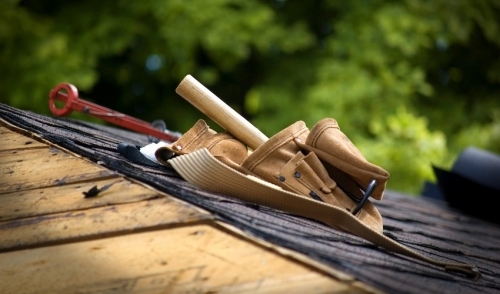 Roofing is hard work and should not be taken lightly. Its one of those things that you try to avoid because its so much work, but the time will come when you have to get on that ladder and take care of what needs to be done. Most people hire contractors, but if you are brave and skilled enough to do it yourself, then here are a few quick tips to remember for putting on that new roof. Before you begin, you will need to tear off the old roof. When doing this, you can use a combination of tools such as a roofing pitchfork, pry bars, roofing nail removers, and shovels. Try to avoid damaging the house in the process. Always grab the corners of the shingles and peel upward by hand. You should do this in large chunks to save time and energy. Tearing off the roof can take a long time depending on how much manpower you have, but getting the roof perfectly clear is very important. Dispose of your waste onto a tarp or rent a trailer that can be dropped off and picked up to be take to the refuse when finished. Once you have removed all the shingles and stray nails, you are ready to lay the roofing paper. Be sure use black 30-weight paper. You should lay it down by starting at the bottom edge of the roof, and after you have unrolled the paper, let it hang off by a quarter of an inch. When securing the roofing paper, use roofing tacks. After you have laid down the first row of paper, begin to lay down the second row and overlap the first row by one line. The lines should be marked on the paper and easy to follow. You should secure every additional row just like the first. Continue to follow this pattern until the entire roof is covered. Make sure to overlap roof hips and valleys when you reach these points. Essentially, when putting on that new roof, you want to make sure you have created a waterproof sheath before you lay your shingles. As you can imagine, if you do not create a solid waterproof sheath, you can create more problems than you fix with your new roof. Once the paper is laid properly, cover the roof with shingles by starting at the bottom of the roof in a corner again, and use the herringbone technique. Shingles have to be laid down straight, so don’t hesitate to draw a line with chalk to guide you. There is nothing worse than having to take all the shingles off and start over because they were not laid in straight lines. When the time comes to ‘cap off’ the roof, use single shingle tabs and overlap them along the length of the crest, hips, and valleys of the roof. When you are done shingling, then you are done putting up that new roof! © 2019 Shone Lumber. All rights reserved.